Give your winter-themed crafts a realistic feeling with fake snow that's textured just like the natural white stuff. You can use many standard craft supplies, toiletries, and pantry items to create craft snow. Get the subtle look of freshly fallen snow with this simple concoction. Use it like paint on nearly any surface, including paper crafts. The powdered sugar helps thicken the mixture while the granulated sugar adds texture and a faint hint of sparkle. Keep the mixture thick and dry for the best coverage. This recipe makes enough for a small project like a painting. To make more, simply multiply the amounts by the same number. Mix both types of sugar. Add warm water and stir until blended. The sugar won't totally dissolve. Add paint and stir until mixed. Paint your craft using a sponge brush or paint brush. Allow time to dry completely. Use old crayons and glitter to make a sparkling, textured snow that rivals the real thing. Since you're working with wax, this type of snow works best on projects with a sturdy base such as those made from wood or canvas. Avoid using this snow on flimsy materials like paper, because the end product will crack when the paper bends. Use lots of crayon chunks close together for thicker snow. Cut half of the white crayons into small chunks. Grate the other half of the white crayons into shavings. Glue the crayon chunks onto your craft project. Melt the crayon chunks using a blow dryer on hot and low. While the wax is still wet, sprinkle the melted crayon with glitter and crayon shavings. 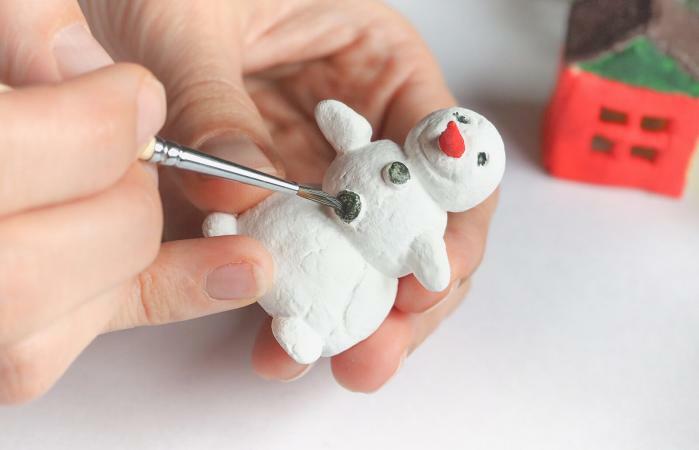 Make a chalky snow that smells awesome with baby powder and hair mousse. This lightly textured paint-like snow can be used to frost containers or faux greens. Avoid over-mixing as the mousse will dissolve and your spread won't stick. This recipe makes enough for a small craft project such as coating one mason jar. Coat the bottom of the bowl with half the baby powder. Spray mousse in a circular motion on top of baby powder until covered. Sprinkle the other half of the baby powder over the top of the mousse until covered. Use the paint sponge to press the layers together gently, but don't stir it or mix it thoroughly. Coat the sponge in the mixture by pressing it down on each side several times in the mixture. Then, you can paint it on your surface. Coat with a clear spray sealant. You can use nearly anything white to create snow on craft projects, but each material works best for different crafts. If you need a quick and easy snow-like medium, try out these options. For the most realistic looking snow, paint your background white before adding any fake snow material. Pull apart cotton balls or batting for fluffy snow. Snip off the end of cotton swabs and use the ends for rounded snowball-like pieces. Add white glitter to glue, paint, water, or other liquid materials for a sparkling snow. Use tiny styrofoam beads or shredded packing peanuts to get a 3D look. White felt works great on fabric crafts. Add shredded coconut to vases and jars or glue onto other surfaces. You don't need to wait for winter to get the snow falling. Check your bathroom, pantry, and craft supplies for white materials and get creative with turning them into a snow substitute.